In Strange New World there are 9 levels in total and 5 differences in each. 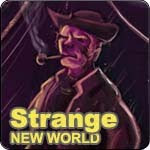 Solve each level to uncover the secrets of the "Strange New World". It goes in the same sequence as TheRealShadmans original piece so you can follow the story by solving each level. To uncover a difference simply click on it with your mouse. Press P to pause and M to mute the music. Can't solve a level? Simply click the walkthrough link in game for the full solutions.